Duncan Courts is the Director of Music at St Peter’s, and is responsible for overseeing all music-making in the church. He directs the church choir of boys, girls and adults, and the St. Peter’s Chamber Choir and Consort, and accompanies the St. Peter’s Singers. 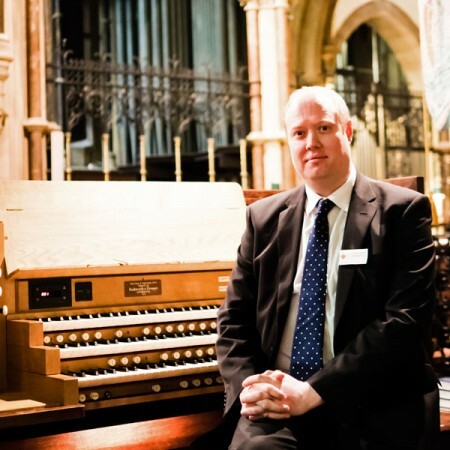 Duncan studied the organ with Andrew M. Wilson and Margaret Phillips, acquiring the Royal College of Organists’ Certificate in Organ Performance in 2012. He held organ scholarships at Kelly College, Devon, and Birmingham University, followed by several church posts throughout the South West, more recently at Christchurch Priory where he directed the Priory Singers and Chamber Choir. He also directed the Fountain Singers between 2005 and 2011, visiting a number of cathedrals and greater churches in the UK. He arrived at St. Peter’s as Assistant Director of Music in 2011, and became Director of Music in September 2015. Duncan is married to Caren and has two children. Alongside his passion for the English choral tradition, he holds qualifications as an air traffic controller and in software engineering.